Facilitates elimination of excess oestrogens in men and women. Used in the prevention of oestrogen-related cancers such as breast cancer. May boost natural detox processes. Calcium D-glucarate is the calcium salt of D-glucaric acid, a substance naturally present in small amounts in the body as well as in fruits and vegetables such as grapefruit, apples, oranges, broccoli and Brussels sprouts. 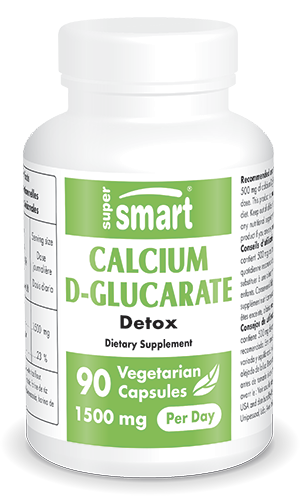 Free from side-effects, calcium D-glucarate constitutes a major antioxidant because of its effect on a particularly important phase of the detoxification process: glucoronidation. Glucoronidation is the most important conjugation reaction in phase II detoxification. During this phase, carcinogenic chemicals, steroid hormones and other fat-soluble toxins bind to glucuronic acid in the liver and can then be excreted through bile and subsequently eliminated from the body in stools. Animal studies have highlighted that when taken in nutritional supplement form, calcium D-glucarate is metabolised in a balanced way into D-glucaric acid, D-glucaro-1.4-lactone (glucarolactone) and D-glucaro-6.3 lactone. Glucurolactone is known to have a direct and powerful inhibitory effect on beta-glucuronidase, an enzyme produced by microflora which is able to deconjugate toxins. Calcium D-glucarate supplementation impedes the action of this enzyme, thus increasing excretion of potentially toxic or carcinogenic compounds. Calcium D-glucarate supplementation should therefore be included in any detoxification programme and hepatitis treatment because it promotes the elimination of toxins such as mercury, nicotine, paracetamol, non-steroidal anti-inflammatories and other medication residues. Glucuronidation is the principal mechanism through which steroid hormones, particularly oestrogens such as oestradiol, are broken down and excreted. However, this normal process can sometimes be impeded by beta-glucuronidase which releases oestrogens into the bloodstream. By inhibiting this enzyme, calcium D-glucarate reduces the total oestrogen load on the body as well as that of other hormone metabolites. It is therefore particularly recommended for premenopausal or menopausal women whose oestrogen levels remain too high. In a preliminary study in rats, calcium D-glucarate was shown to reduce incidence of mammary tumours by as much as 70%. According to the study’s authors, it inhibits or delays the promotion phase of mammary carcinogenesis by lowering endogenous levels of oestradiol and precursors of 17-ketosteroid. Moreover, calcium D-glucarate was initially investigated for its potential to prevent prostate cancer due to its aromatase-inhibiting potency, and was subsequently studied in relation to lung and colon cancer. With its detoxifying properties, calcium D-glucarate may significantly improve tolerance to medications prescribed for erectile dysfunction. Given that these expensive treatments lose some of their efficacy after a few weeks’ use, many men may well find this invaluable. For an optimal detox, it can also be combined with other nutritional supplements such as Cruciferous Detox Formula, a blend of cabbage extracts known for their detoxifying action in the liver. The supplement Colon Cleanse Formula may also be of interest for effective detoxification of the colon. Discover too the innovative formulation Lectin Flush for eliminating lectins, proteins implicated in some instances of food hypersensitivity. Totally free from side-effects, this supplement can be taken in high doses to boost the body’s natural detoxification processes.